Why are we reviewing a game that came out in 1999 and had terrible sales? Well mostly because it’s finally out of legal limbo (which I’ll get into shortly) and is now on sale at Good Old Games (though there’s a few little hangups which I will get into later.) A game that’s close to fourteen years old. How well does it hold up? Short answer? It still manages to terrify me in spite of the dated graphics and expected twist near the middle. Long answer? Well let’s take a look at the game itself before deciding. It’s 2013 now, one year shy of the game’s 2114 and I’m sure everyone knows the general song and dance now but if not I’ll be yur tour guide thorugh this haunted house in space. You wake up with no memory of the past few weeks or even where ‘here’ is. There’s lots of things trying to kill you and everything’s gotten trashed and everyone else is dead or worse. Through the game you figure out that you’re on a ship, the first faster than light capible craft, that found something in the Tau Ceti System (amusingly enough there are planets in that system, a fact that was not known back when this game came out) and then all hell broke loose. You have to piece together what happened through reading logs, get help from some never-seen guide, and try not to die in the whole process. Wait. Let’s back up a tick here. There are several mechanics that were first scene here used in latter games (Doom and Bioshock’s use of Logs come to mind, RPG-Like Stats and Abilities are another.) In comparison to latter offerings the mechanics might feel clunky and Dated, but as a matter of personal opinion I felt the interface to be easy to deal with (when it wouldn’t glitch out due to me using something with integrated intel graphics.) Unfortunately while the Hacking, Modifying, and Repair mechanics are easy to get around Psionics (the game’s equivalent to Magic) felt lackluster to me. I’m going to leave that one to the fact no matter how many times I’ve played through the game I’ve never been that good with the Psi career path, and the fact psi-hypos (the only thing you can use to replenish psi-points to let you use fireballs, invisibility, etc etc) are harder to find than bullets so you don’t get as much room for error. However dated the visuals look, and they are dated the game’s tense atmosphere makes you forget about it. Instead it makes you focus on the fact your shotgun just jammed, there’s monkey chatter around one corner, a hybrid begging you to kill it coming at you with a pipe, and there’s the ship’s computer in a complete deadpan reminding you of how many shopping days there are before Christmas. Let’s go ahead and get the elephant out of the room shall we? The game starts out with You verses some weird hybrid worm Alien Mutant things that are using the bodies of your former crew members to further their own agenda which is to spread the joy of their hive-mind to anyone and everyone willing or otherwise, yet we have the cybernetic female face glowering at us from the box cover. So, who or what is SHODAN? Formally she is the Sentient Hyper-Optimized Data Access Network formerly at the heart of Citadel Station. Her role in this is interesting and varied. Without spoiling the situation itself halfway through the game your disembodied voice/helper shifts from that of Janice Polito Custodian of the XERXES (no I don’t know what XERXES stands for) AI that helps govern the day to day operations of the ship and oversees the FTL drive to getting your marching orders from, well… Her. A little background: SHODAN was charged with oversight of a space station orbeting Saturn. Everything was great, mining, research, all sorts of Things were going on. Then some corporate ladder climber was being investegated so felt the need to have a little insurance by having SHODAN’s ethical constraints removed so he could order her to do very morally questionable things like erase company records of his crimes, blow up shuttlecraft full of investigators, space a load of people for no particularly good reason, and presumably having robots punch babies in the face. The Hacker that had accomplished this, and didn’t have the good sense to have a quick and easy kill switch in case he needed to shut the program down quickly, had been kitted up with some fancy cybernetic goodies and stuffed into a healing coma. Since the Exec in charge of this SNAFU thought it might be good to keep him around just in case he had SHODAN purge records that he’d ever been there so when you wake up not only was your stasis chamber not tampered with so you’d be an obedient little cyborg, but SHODAN also had no idea who you were. This along with the fact the prior resistance had set up caches of weapons and supplies around before dying or being mutated allow you to stop SHODAN’s initial plans for remaking the entire human race into a bunch of sockpuppets she can do whatever she wishes with. Now Then: Partway through you end up having to take marching orders from her. Why? Well to be blunt you two need eachother. While you’re by that point good at Not Dying and doing the legwork SHODAN, even as crippled as she is being isolated on a few subsystems of the Von Braun rather than able to control Everything, is still a super-genius that can plan beyond bashing things in the face. Granted she needs you more than you need her but in the end even with as abusive abrasive and demeaning as she is SHODAN cannot further her goals without you. Just what are those goals? What are the ambitions of an AI that had envisioned itself as a Goddess? Likely nothing good and it’s constant referral to you as an insect, or commenting on how with each upgrade you make to your cybernetics you take an ever slight but forward step towards her ideals of perfection don’t do anything to make you feel any more at ease with the partnership. Even before release users in differing fan communities wondered just what patches and updates were made. After all a few months ago ‘we’ got a patch from an anonymous user posted to a french forum that did things only possible from going through the game’s source code. Did NightDive have this guy working for them? Was the NewDark patch a leaked build we weren’t supposed to have til the GoG release? Matters soured when after release evidence started popping up that community tools had been used for the patch process and no credit had been given. I’m citing usernames here because, well, it wasn’t my work that uncovered anything. I mostly watched from the sidelines as the major players poked around. This was a community effort in both patching and in finding out those patches had been used without credit. User MegaBrutal from Through the Looking Glass Forums have confirmed the exe’s from the GoG version of System Shock 2 and the 2.4 NewDark patches are exactly the same outside of minor timestamp issues likely from differing timezones and dates the patch was applied, which as I understand it, has no bering on the fact that the same material was used. – Night Dive is behind the unofficial patches. That’s a bit problematic, from what I’ve seen NewDark is also used for the Thief patch, ie the same source stem- which certainly isn’t the property of Night Dive. – They just used the fan-made patch without further ado. Then they’re claiming work they haven’t done. That’s rude, but what could an author of a legally ambiguous patch do about that? – They’re claiming authorship to shield the patch author. Possible. That patch is a little on the grey side of things, so maybe they’re just saying it to keep things under wraps. I’m TheEnigmaticT, A.K.A. the head marketingbot at GOG; we’ve heard the comments from you guys here and, after investigating, wanted to get back to you with a reply. Apologies it took so long, but what with some of the involved people being in Poland and some being on the West Coast of the US, there’s a long time lag in getting answers. 1. About the patches from this community that are in use in our build of System Shock 2: Whenever we receive a build from a publisher / developer on GOG.com, that’s the build that we have to use. Night Dive provided us with a build for us to use when we signed the game with them, and it worked pretty well out of the box. Armed only with the knowledge that it contained some “community fixes” for the game, we made a few changes on our own and then, after testing, found it was as stable as any 13 year old game is likely to be. Absent the knowledge of what those fixes were, we couldn’t really request permission / get acknowledgement for the fixes from the community here. Many of you guys here know us; we have worked with some of you before on a paid basis to develop patches and fixes for games that we sell,. We’re not bad guys and we’re sorry about the fact that we’ve upset you all and caused this uproar. We’re open to suggestions from this community on how we can address your concerns about the community-created content in the build in a manner that’s fair to all parties. It’s worth noting that any changes that we want to make to a build have to go back through the approval process with the publisher (Night Dive) again, however, so anything that we decide to do together will take time to go into effect. You guy seem particularly angry about the wording that Guillaume used in the interview he gave with RPS (There are some user-made mods out there which do phenomenal work on the game’s stability, but none of them were quite perfect, so we took the game to our expert techninjas to analyse and swat the remaining bugs). I think this may be a case where you’re focusing on the negative excessively here. Guillaume explicitly acknowledges that you guys have “done phenomenal work on the game’s stability” (it’s a direct quote! ); that said, our build engineers did make a few changes that, in our tests, improved things enough where we decided that they were worth committing to our version of the GOG.com installer for System Shock 2. Again, I’d like to apologize if you guys interpreted this as a slight. It wasn’t intended as such. So what can GOG.com and TTLG do together to help make you guys happier about this release? I’ve got a few suggestions, and I’m willing to hear yours as well. 1. Giving credit for the community-made mods in the build notes is certainly possible, although problematic for everyone because as I understand it, patch 2.4 was developed by someone whose real name is unknown and who appears to somehow have had access to the source code. For the rest of the content, we’re happy to move forward with including some kind of acknowledgement for you guys. 3. Generate a new build that does not rely on SSTool. This is a little tricky for us, as it will require that we both retest the whole game again once we’ve made our build and also resubmit the build to Night Dive, since it will not be the one that they gave us. I’ll admit that it’s probably not our preference–SSTool works quite well, from what the build team has told me–but if you guys would prefer that we don’t do that because you feel it’s stealing from you, we understand it and we’ll try to work with you all on this issue. Do keep in mind that if we decide that this is a path to take, it will take some time to accomplish. Remastering, retesting, and reapproving are, none of them, things that happen overnight or even in a week’s time. That’s all I can think of to help address all the concerns you guys have. What are your thoughts? Note: I’ll be in a meeting for the next, like, four hours, (and my account at TTLG is in the queue awaiting mod approval :P) but I’ll check back in as soon I’m done with it. Personally I’m fine with just crediting the community as a whole and calling it a day since really that’s all anyone seems to want. Acknowledgement that the work done to make this gem playable had already been done. Nobody, so far as I’ve seen, is advocating a boycotte or forming angry mobs. 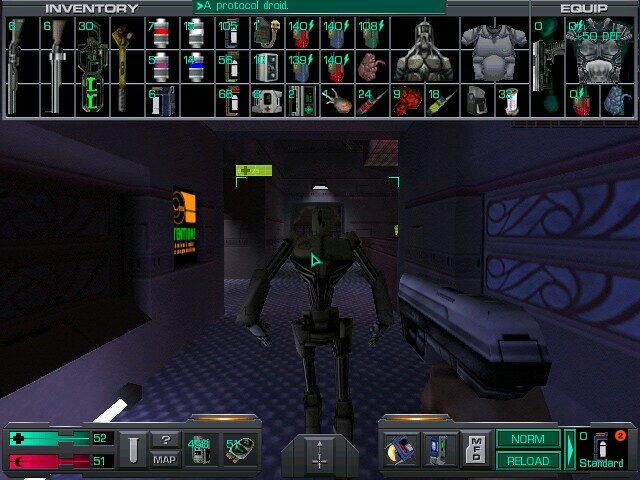 After all even with fan assets used NightDive managed to untangle thirteen years of legal mess that’s kept System Shock 2 in legal limbo and out of the hands of the fans outside of either ebay or questionably legal means. [I] can’t speak for everyone, but I guess a mention in the readme and on the gamecard that the GOG build uses NewDark (to avoid potential confusion – people might think the GOG build uses something completely new and different, when it fact it’s normal NewDark). plus mentioning that the build has been created via ss2tool. I think that would be more than enough. Buy/Don’t Buy? : At $10 that’s a no-brainer. 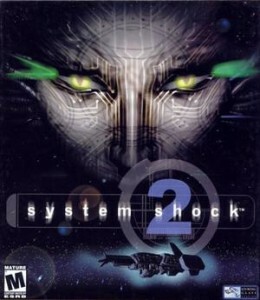 It’s a game with Story, replayability through trying different Upgrades, and if the actual game gets boring head to systemshock.org and grab a few fan missions, or try out a few gameplay mods. Normally with the clouded providence of Night Drive using Fan Materials without credit I’d be Angry. I’d be livid and Furious. Here though? It’s a game that’s been out of print for thirteen years. I’m just grateful Night Drive managed to get the digital distribution rights. The Good: Impressive Atmosphere, The ability to scare people even after thirteen years, Now Legally Obtainable, Lots of mods to change gameplay and visuals. The Bad: Night Drive having claimed credit due to to the Fan Community for making the game work on Modern Systems, Dated Visuals, Mid-Game Twist spoiled by the Box Art, Multiplayer co-op that’s Almost Unplayable, Not Long Enough.